My future wife and I are huge Dominion fans. We’ve played several games a day over the last few years, and only recently decided to take a break. During that time, I’ve learned I’m a better engineer than Dominioner and devised a secret scheme to program my way out of losing more often than not. I was quickly discovered and that began a journey of building a program that could take any situation or any set of cards and produce an optimal outcome. “Should only take a couple days”. That was quite a while ago, but today I feel it’s in a state that it needs feedback from someone who isn’t in my head. 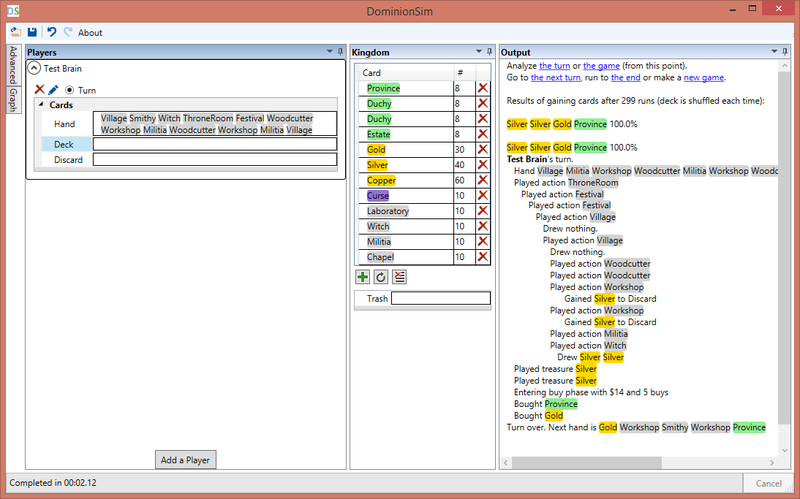 DominionSim is a WPF app with a C++ core. It’s built to be multi-threaded and with a UI that’s easy to describe game situations. It will run best on a high end, multi-core PC. Internally, each turn has its action possibilities enumerated and by cloning the game, the action can be played and new possibilities can be enumerated. It doesn’t cheat by knowing the cards of the opponent or what exactly it will draw. But it does track cards it’s played and can reasonably guess what draw will come next to decide on what to play. How is it different from Geronimoo’s simulator? There is no hard coded action or trash priority list. 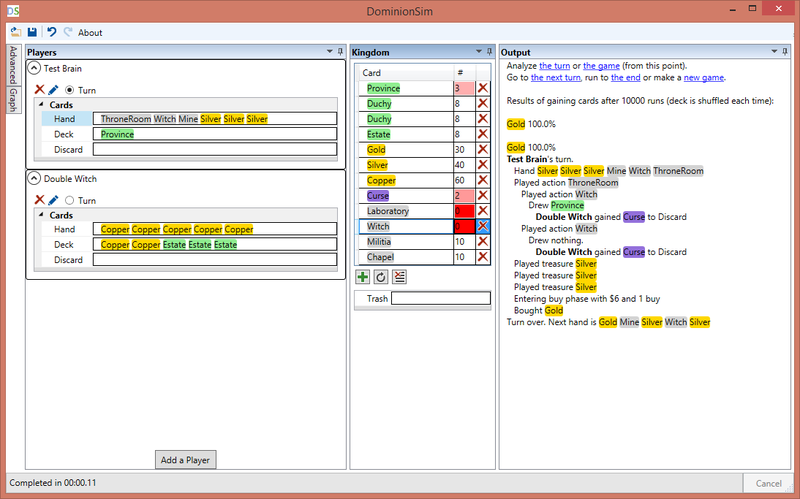 There are some hard coded responses to cards (like trashing opponents cards with Thief), but most situations are dealt by enumerating possibilities and choosing the one which gives the best result according to the player’s code. 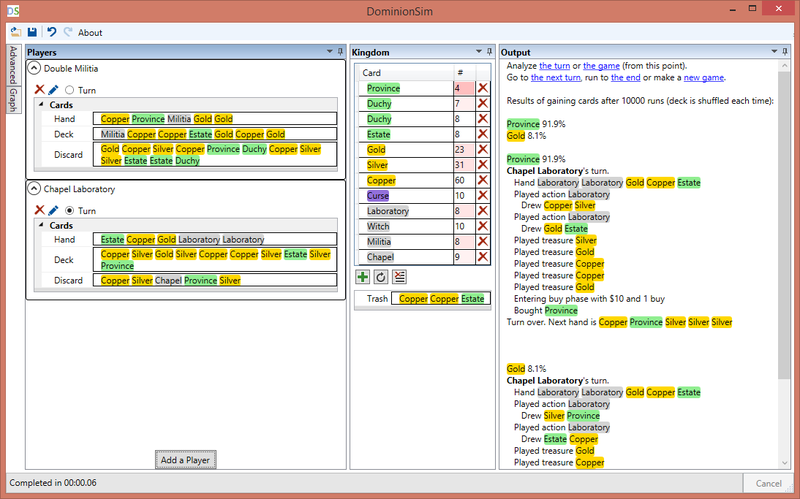 My goal with DominionSim is to explore interaction of cards which will generate human usable results. It's not there yet, but the essence is coming along. So what stuff can it do? - Solve a turn for likely best play. 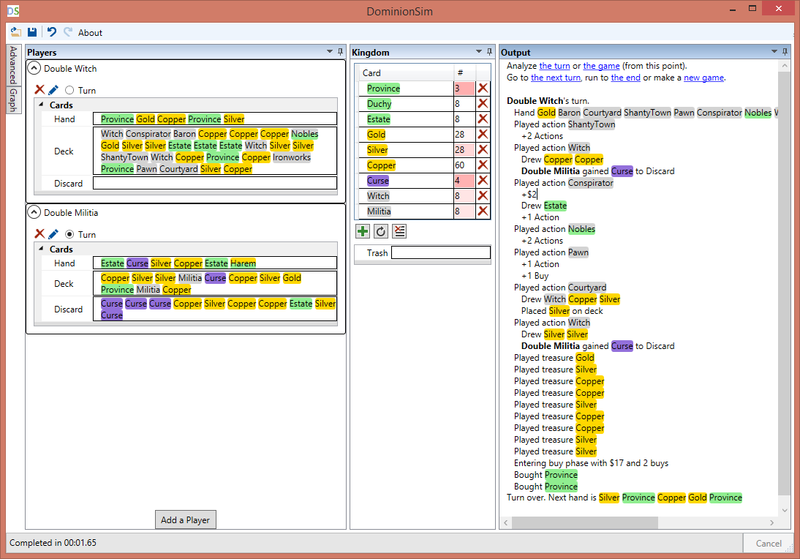 - Flexible language for coding priority gain, trash and play action lists with code complete. - Everything is customizable. Change any pile content to anything. No limits on player count, starting cards, cards on the board, etc. - Live output. Quickly iterate on games and use links to jump between states and tools. 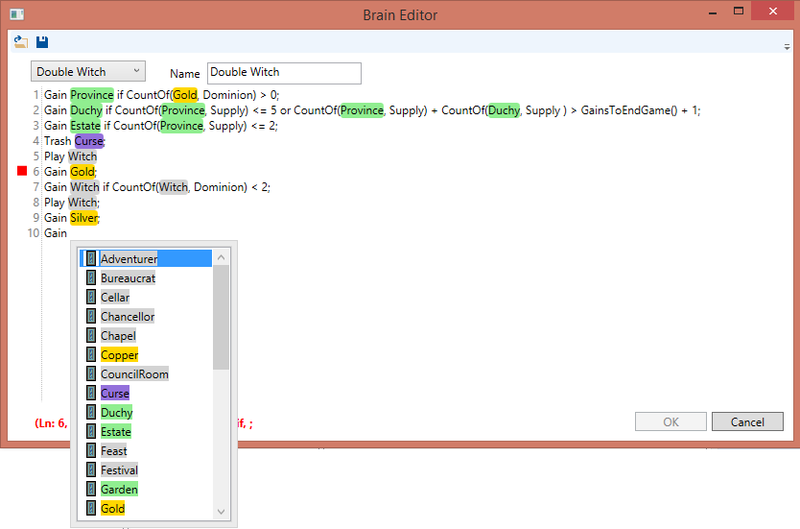 - Undo, redo, save and restore all state or individual brains using XML. - Only the first set of cards at this moment. - Some cards generate large number of choices (Cellar) and can hang the game in extreme situations. - Borrowed some strategies from Geronimoo’s simulator to seed the brains, but long way off from a robust set. - It’s not done, this is beta, find the bugs. Thanks to anyone who gives it a try and gives feedback! This has been fun to build and I hope can be more than a science experiment that I've filled my free time with. Thanks to Geronimoo’s simulator for the inspiration to make this one. Flexible language with code complete. Priority list can value Play-ing a card or Trash-ing a card over Gain-ing one. Find great results from complicated hands. Here it finds a way to play cards to get enough actions, then generate Silvers with Woodcutter, then draw them with Witch. Incredible. Hope it works for Macs, I'd love to tinker with strategies. Very interesting. Props for doing that. Second, maybe change CountOf(Gold, Dominion) to CountOf(Gold, Deck)? At first I thought it was counting how many Golds were in the entire game. Third, how many cards do you have coded, and how are you going about coding them? Is it in your plans to reveal the source code at some point? It will only run on Windows, but you can run it on a VM or with Boot Camp on a Mac. For CountOf(Gold, Dominion), I debated this a lot because the term "Deck" is overloaded and am open to suggestions. The Dominion rules refer to "Deck" as the pile you draw from. At the end of the game, you put all cards in your deck and calculate VP. There isn't a term for "all your cards" so I thought your "Dominion" was the appropriate term. Also what's missing is an enum for describing the draw pile deck to count of cards in there (I just didn't get around to implementing it yet). 1. 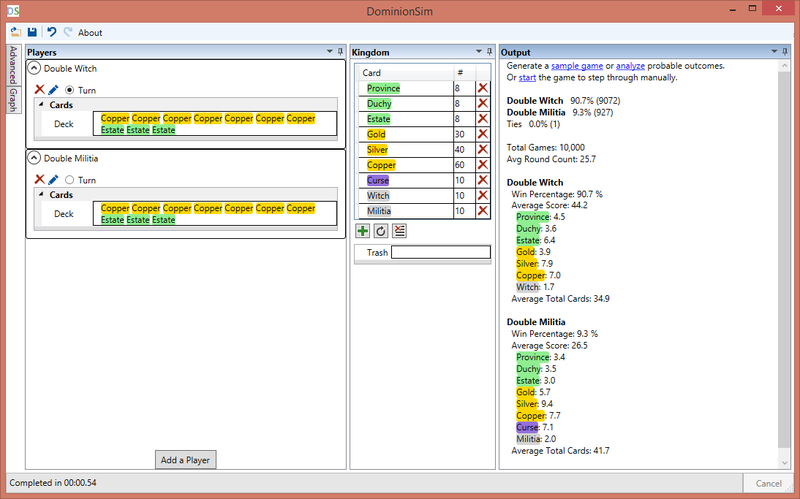 Dominion for "all cards" and Deck for draw pile during game. 2. Deck for "all cards", DrawPile for draw pile during game. 3. AllCards for "all cards" and Deck for draw pile during game. I'm about a 3rd of the way through the Intrigue cards. Goal is to get to them all eventually. There's some that I will likely procrastinate on (Possession). But I also want to focus on getting the tools right too. The tools decide how the cards are authored and I've re-authored the cards like 3 times since starting. So I didn't want to accumulate a huge set of cards I would have to redo again. I think the architecture is pretty good right now, so I'm going to get Intrigue done and go from there. Don't know exactly how you've coded this, but may I suggest Player.Cards for all of a player's cards? I guess then Cards would be an attribute of a player object, I tend to think in object oriented terms though. Also, on a related note, is it possible to specify your opponent's Cards or Deck? I mean, you can write in protections so the strategy can't cheat, but I would reasonably, as a player, know the CountOf(Province, Opponent.Cards), and I could definitely imagine wanting to know this in a strategy. I'd vote for option 2, with ephesos' suggestion of marking Player1.Deck, Player2.Deck, etc. I went with option 2 for now. So back to what everyone is familiar with: CountOf(Province, Deck) for how many Provinces you own overall. Opponent's cards are tricky. First, you don't know how many opponents you have or your brain is only good for one kind of game. So any function has to account for all opponents, or the one winning or something else. Second, you can't always calculate what cards they have. Masquerade in a 3+ player will mean one player passes another player a card you can't see. You can calculate the difference between your cards and the supply, yielding how many all of your opponents have. AllOpponentsCountOf(Province). This is what Geronimoo's simulator offers. Additional output while playing actions, ex: "+2 Actions"
Does AllOpponentsCountOf(Province) take the TrashPile into consideration? I would think that it should; I'm not sure about officially, but I know you can always look through the trash on Goko. Also, it would be nice to just know how many cards my opponents have in total; e.g. AllOpponentsCountOf(*), where * will match any card. Either that, or maybe LeftOpponentCountOf(*), though that has issues in solitaire. I remember having to code Dominate to just outlast all possible opposition when playing the Masq pin by going for 100 turns, and it took forever to analyze. Very nice! 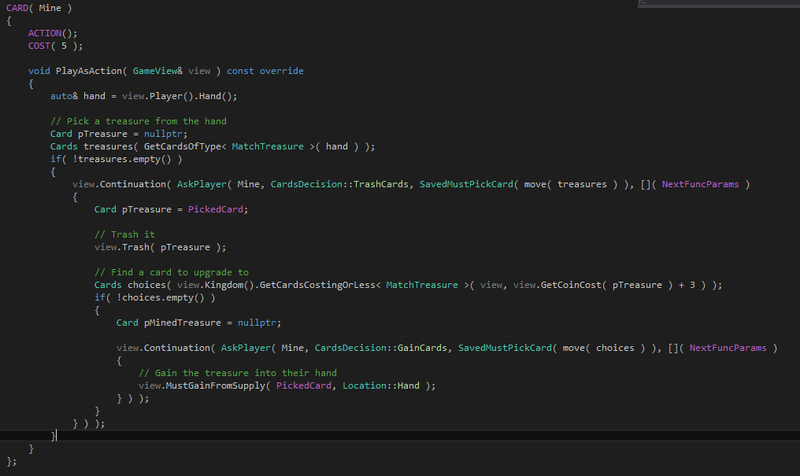 Implementing all of the cards takes quite a bit of time. I had the same thought process as you - but a couple years later, I still have 3 cards left to implement. Have you considered building on top of an existing engine? It may not be easy on top of the more popular ones, but Dominulator should have the infrastructure you need. You'll find references to it in this forum. 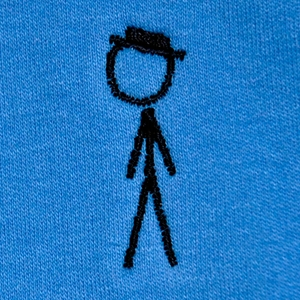 It's a c# backend which has separated the rules of the game from the choices players make. Just about all of the cards (excluding Adventures) have been implemented. (though unit tests are minimal). On my PC, it can simulate a turn from rules similar to Geronimos in about 2 microseconds. A whole game takes about 83 microseconds. I was not aware of Dominulator, it looks awesome! Someone should update the simulator page with all the options. What license is the Dominulator source released under? 1. Search turn space for best play, zero to little hard coded priority lists. All together these require some special attention. Also because I like modern C++ programming and no one's done this kind of tool yet. The key part here is "view.Continuation(...)". This allows the engine to re-enter this code to try different options. It simulates each combination by cloning the game it can see and measures the result. From there it picks the best after a certain recursion rate (5 right now) and then makes the actual play. This means it can (in theory) make better decisions based on the behavior of the cards instead of a list. These continuations are recursive within cards. ThroneRoom can result in a large chain of nested Continuations and the game will plug in different decisions at each level to get the best result. One interesting differentiation I see in the approach you are taking is the "try all permuation" approach to evaluating strategies. I considered this approach, but I was worried that the branching factor would become too high. For example, a hand with cellar and a bunch of pawns has quite a high branching factor for searching the entire space. I have a friend who also advocated for the approach you are taking - but he never implemented it. I'm looking forward to seeing more of your results. It's an interesting approach you are taking with continuations. Unfortunately modifying dominulator to use continuations would require revisiting each card. I likely won't have time to do that. 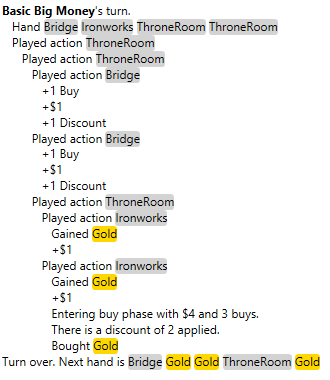 However, I always considered that if I wanted to employ a solution that requires iterating the permutations of all available actions - would I would do is clone the gamestate at key points (probably the beginning of each players turn), and then build up a description of actions the user would take during that turn. One description might cellar one set of cards, and a second and third description might cellar different sets. With this approach, one would be able to look at the set of descriptions as a whole, and perhaps remove obviously uninteresting, or repetitive permutations. I'm just musing now. Forgot to answer your question. The license on dominulator is pretty loose. I would prefer for people not to fork the code base for the purpose of taking it a different direction, but I welcome any non-profit use of it, and encourage people to contribute back into it. It's all open source for people to play with. But the readme is sorely out of date. I should update that I think.